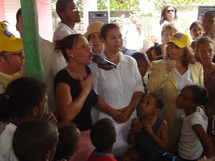 ​​PPAF works in the area of health as opportunities present themselves in Madagascar, the D.R. or Haiti. PPAF seeks to bring together potential partners from the international community, business, NGOs and local organizations and communities to make a difference in the health of people in poverty. This has involved familiarization with problems of lead poisoning in the D.R. 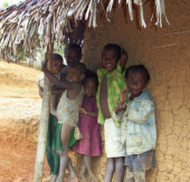 and shipments of medical supplies and equipment and provision of hearing aids in Madagascar. Promoting and protecting health is essential to human welfare and sustained economic and social development. This has long been recognized as a way to contribute both to a better quality of life and also to global peace and security. There are many ways to promote and sustain health. Some lie outside the confines of the health sector. The circumstances in which people grow, live, work, and age strongly influence how people live and die. Education, housing, food and employment all impact on health. The UN Global Goals (2015-2030) assign an important role to health not only in Goal 3 (Good Health and Well-being), but in many of the seventeen goals overall. 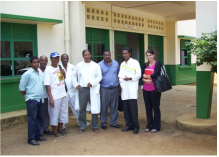 Through PPAF's partnership with the Starkey Hearing Foundation, about 6,000 hearing aids were distributed without cost to needy persons in Madagascar in October 2011. PPAF, along with the Rotary Club of New York and the Madagascar Mission to the United Nations, got the ball rolling with the Starkey Foundation in 2010. The Madagascar Mission to the UN continued to stimulate and encourage the project and its achievement. PPAF board members Ambassador Zina Andrianarivelo and Scott Wright, along with Senior Fellow John German and staff of the Madagascar Mission worked to make this come about. 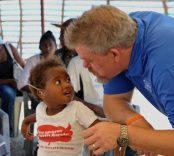 The Starkey Hearing Aid Foundation, the Madagascar Ministry of Public Health, three Madagascar Rotary Clubs and their associates, and several corporate sponsors combined efforts on the ground. The Ministry of Budget and Finance and the city governments of Antananarivo and Tamatave facilitated the work. The event took place under the patronage of the President of the Transitional Authority of Madagascar. Beginning in 2008, PPAF reached out to Project C.U.R.E., which collects and delivers medical equipment and supplies to health organizations in many developing countries. The Ambassador of Madagascar to the UN and others of PPAF facilitated such donations to Madagascar through Project C.U.R.E., and corporate funders, ultimately resulting in delivery of nine 40-foot shipping containers of goods to several hospitals and clinics. Each container was estimated to hold about $400,000 worth of goods. 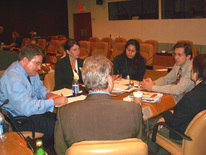 Seventy representatives from the UN, the private sector and civil society met at the UN on 16 July 2008 for deliberations on “Partners against Poverty – Awareness, Agreements and Actions”. This second annual PPAF meeting at the UN treated a range of topics, including a special emphasis on health. Others were agribusiness; tourism & the environment; women, entrepreneurship & microfinance; and renewable energy. PPAF began its work in health-related assistance by participating in a delivery of vitamins, medical supplies and medical services to Haina, D.R. in 2007. This was in response to a well-known and studied problem of lead pollution from bootleg smelting of car batteries for lead to sell, with brain damage and related health consequences, especially for children. The chief organizer was the Blacksmith Institute.